Accursion Bentivegna’s home club is Palermo. His name first made its rounds around the world during the prestigious Viareggio Cup 2014 – one of the most importang youth football tournaments in the world. At that tournament, Accursio played some wonderful football and led the young Rosanero all the way to the semifinal. His great goal in the quarterfinal match against Hellas Verona will be remembered by the fans for a long time to come. 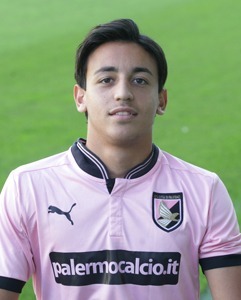 He’s made his debut in the first team fairly recently – on August 31st 2014 in the first round of Serie A, he came on as a substitute in stoppage time for Franco Vazquez. “Alessandro Del Piero is my role model, but technically he was much stronger than me”.